Tequila 101 | Have YOU Ben Starr Struck? 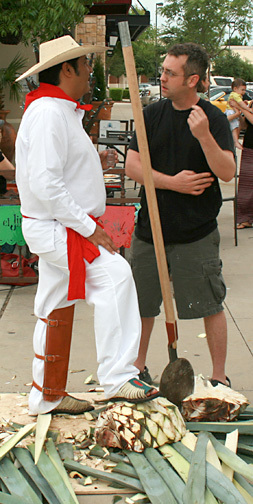 So I’ve just returned from an agave cutting demonstration at Agave Azul, my favorite gourmet Mexican place in Dallas. Tequila has been one of my favorite liquors for over a decade, but it’s only just now coming into its own as a true craft beverage. Fraught with an out-dated reputation as a harsh alcohol only worthy of shooting, the average American is primarily familiar with mass-produced, piss-poor tequilas whose big brand names pop up in subsidized pop songs; haunted by memories of horrific hangovers, the average American doesn’t think of tequila as a refined drink, to be sipped and savored. And it’s high time that changed. Let’s take a quick look at what tequila is, and how it’s produced. All liquors are produced by distilling a mildly-alcohol beverage to extract some flavor and concentrate the alcohol. In the case of vodka, this might be fermented potato or barley. For whiskeys, it could be fermented barley, wheat, or rye (ie “beer.”) For brandy and grappa, it’s fermented grapes (ie “wine.”) For rum and pisco and cachaça, it’s fermented sugar cane juice. But for true, authentic tequila, it’s fermented cactus. Yup…a long-lived, massive cactus called “agave azul” or blue agave. (Pronounced “ah GAH vey.”) Nicknamed “century plant,” agave can live upwards of a hundred years before they spectacularly bloom, and having saved up so much energy in the form of stored starches in the plant’s massive central bulb, when the agave blooms, its stalk can grow so rapidly you can watch it rise, up to several inches an hour. After a short week of blossoming, the plant’s energy reserves spent, it dies. Blue agaves raised for tequila production are generally harvested at less than 10 years of age. 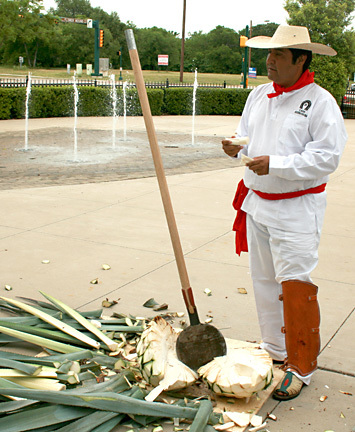 The “jimador” (pronounced “HEE mah DOHR”), like Sr. Jose Cortes seen here, judges when the agave is ready for picking. 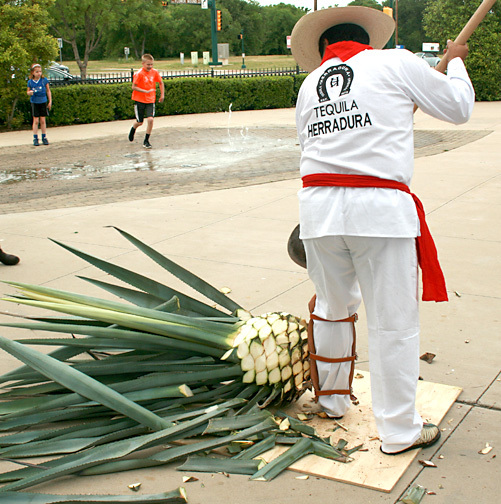 Then he cuts it off at the ground using a very sharp, heavy tool called a “coa” and prunes off the sharp spines from the agave, turning the cactus into a “piña,” or pineapple, named for its resemblance to the fruit of the same name. An agave piña, however, can weigh from 80 to over 200 pounds, and it can take up to 10 piñas to make a single bottle of tequila. The jimador works in the field for 10 hours a day during harvest season, pruning agaves and tossing them into the bed of a truck. The agave fields are fraught with danger, from poisonous snakes to potential heat stroke. But the biggest danger comes from the plant and the coa tool themselves. Sr. Cortes showed me a scar where his left eyelid was ripped open by the needle-like spines on the edges of the agave fronds. 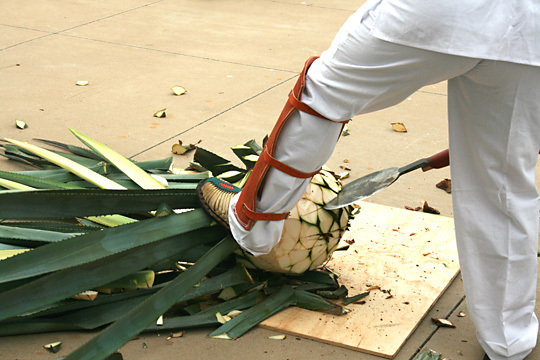 And the 30-pound coa, which the jimador sharpens after harvesting each piña, can inflict deep wounds and break bones. Scars on his arms and legs were proof. Then the piñas are crushed and allowed to ferment naturally using wild yeasts for several days. (Most commercial operations pasteurize the agave and use a commercial yeast strain.) At this point, the pulp contains about 4% alcohol. The pulp is heated gently and carefully, so that the alcohol and some flavor compounds evaporate, and then the gas is condensed back into liquid. This is called distillation, and it is repeated twice to yield a clear liquor of 40% alcohol concentration. There are 3 primary types of tequila produced. The first, blanco (or “white”) is the clear liquor resulting from the distillation. Most tequila aficionados consider blanco tequilas to be the purest type of tequila, as the flavors of the agave come through quite clearly. But cheaper, mass-produced blancos can be very harsh. I recommend only trying premium blancos. A good one can be incredibly smooth. Cheaper tequilas are called “mixtos” and aren’t made from 100% blue agave. They are “filled out” with other fermentable sugars. Look for labels that specify “100% de agave” for a true tequila. And while tequila is now being produced in places other than Mexico, all the true tequila houses hail from the region near the town of Tequila in the Mexican state of Jalisco. The third category of tequila is called añejo, and these tequilas have been aged 1-3 years in small batches. They are among the most expensive tequilas, and they can be very mellow and have all sorts of complex notes from the ageing process. A new type of añejos called “extra añejos” have been aged at least 3 years, and these have only been produced since 2006, so they can be hard to find and breathtakingly expensive. But many small, savvy producers have been saving and carefully ageing their tequilas to cater to the skyrocketing world-wide demand for extra añejos, so expect the prices to come down…in a decade or so! I hope you’ve enjoyed this little introduction to tequila! Next time you’re at the liquor store and there’s a tequila rep there promoting their brand, take a few minutes to ask them questions and sample what they have to offer. 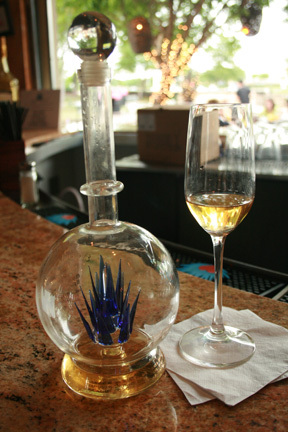 If you live in the Dallas area, check out Agave Azul, which has the largest selection of tequilas in Texas. In Los Angeles, check out Rick Bayless’s Red O, with a truly STUNNING walk-through tequila case, and their mixologist makes some of the most stunning tequila drinks I’ve ever tasted. This entry was posted in Blog and tagged agave, agave azul, anejo, blanco, blue agave, coa, extra anejo, jimador, reposado, tequila. Bookmark the permalink. The Agave is NOT a cactus..this plant is actually related to the lily and amaryllis (it has its own genus, Agave). Its a succulent plant like the Yucca. Other then that..great article. Uh…YEAH I want to! I’ve been wanting to wander the agave fields and watch the jimadors at work!